At the Main Screen click on Turtle Mode. This takes you into a visual programming language. To activate one of the Examples, drag the example to the right into the programming area and click on the Run Turtle button. 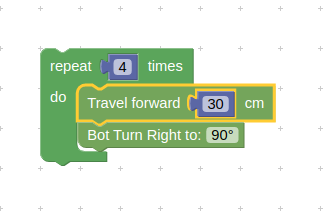 This program will move the FHTbot forward 30 cm and turn right 90º this will repeat 4 times. This visual programming language is similar to Scratch. Scratch is a free computer program that you can download for your computer from http://scratch.mit.edu. There are many examples in Google on how to use Scratch.